Electric Deep Fryer Just $39.99! Down From $110! PLUS FREE Shipping! You are here: Home / Great Deals / Amazon Deals / Electric Deep Fryer Just $39.99! Down From $110! PLUS FREE Shipping! Don’t miss your chance! Amazon offers this Gourmia Compact Electric Deep Fryer for only $39.99, down from $109.99 PLUS FREE shipping! 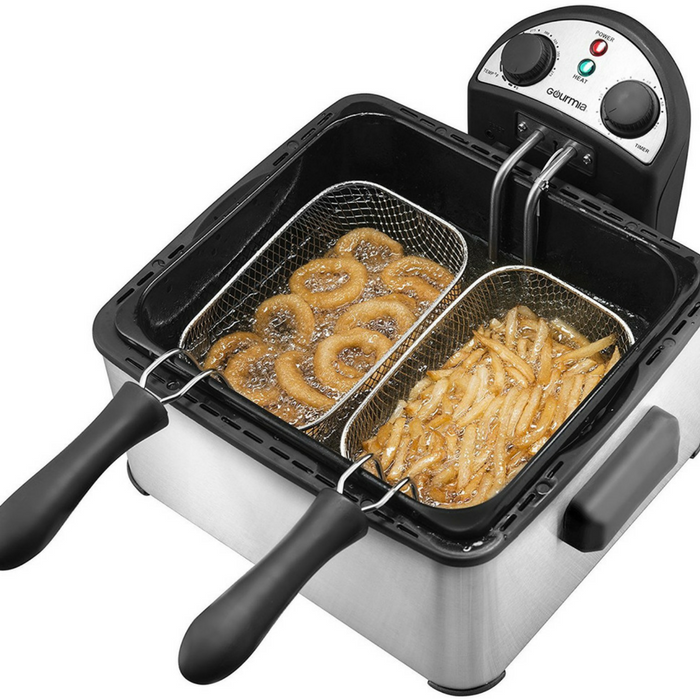 If you love fried favorites like fish and chips, fries and onion rings, donuts and dumplings, but hate the wait or can’t stand having to keep one warm and losing that fresh fried taste, while the other is stilling frying, the Gourmia Compact Electric Deep Fryer is perfect for you! Thanks to the Multifry Triple Basket design and massive 1 gallon / 4-liter capacity, you can choose between simultaneously preparing 2 mouthwatering favorites of your choice or preparing one single party sized favorite as easily as switching baskets! 3 FRYING BASKETS: Includes 1 large capacity basket and 2 smaller baskets that attach to a double basket to do more with your deep fryer! Double basket features innovative Lock Block flavor technology to fry 2 different foods side by side without mixing flavors. USER-FRIENDLY: Includes spatter reducing lid, clear viewing window, separate timer and temperature controls and ready light. Auto shut down thermostat, fully detachable magnetic power cord and nonskid rubber feet included for safety. EASY TO CLEAN: Easy to clean removable enamel fry tank and stainless steel exterior makes it even easier to deep fry and easy to clean.